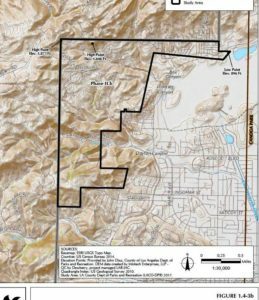 Plans to build miles-long hiking trails leading to the Santa Susana Field Laboratory (SSFL) in west San Fernando Valley without full environmental review are quietly progressing, a month-long EnviroReporter.com investigation has found. This vetting failure ignores SSFL’s gross chemical and radioactive pollution. The County of Los Angeles Department of Recreation and Parks’ plan, which involves two large parcels in unincorporated parts of the county, will come before the Board of Supervisors for final approval this spring. The area of concern is called “Phase II.b” which borders the lab, site of three partial nuclear reactor meltdowns which remains astronomically polluted. 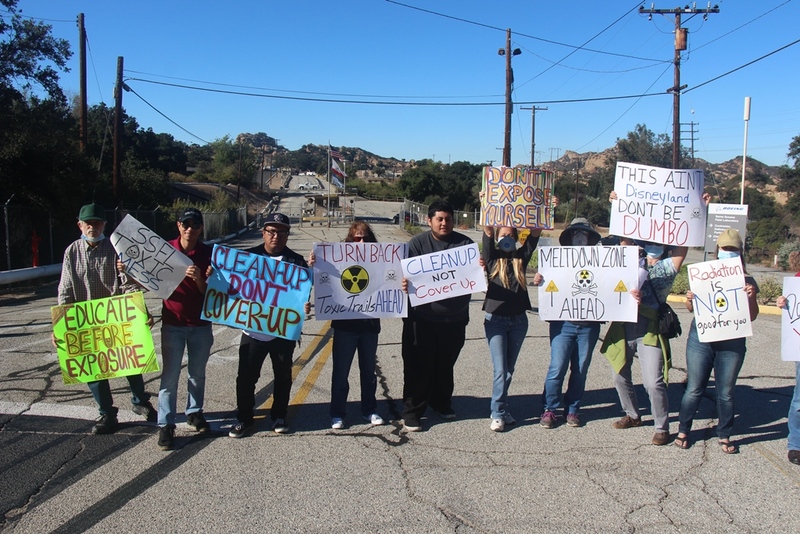 Analysis of the scheme finds that it disregards toxic threats from the 2,850-acre former Rocketdyne site and contamination that has also been found in the proposed trails area. It also memorializes a longtime SSFL anti-cleanup gadfly with a new trail named in his honor and undermines Los Angeles County’s official position of demanding a full cleanup of SSFL. 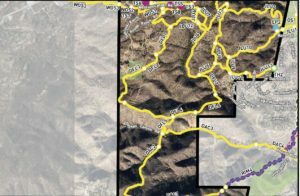 The county’s Santa Susana Mountains Trails Master Plan – Phase II calls for carving new walking, biking and horse riding paths into the hills downslope and bordering SSFL in Phase II.b’s 2-square-mile area. Bathrooms, staging areas, signage and a new 4.5 mile long trail adjacent SSFL are all part of the plan. The unapproved proposal violates protocols of the California Environmental Quality Act (CEQA) by not disclosing potential environmental impacts of Phase II.b bordering SSFL which would connect new trails to ones already at the polluted site owned by Boeing. 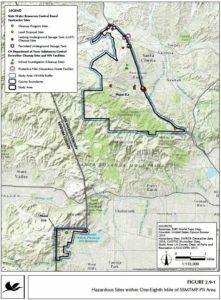 “The information collected informed the proposed trail network developed as part of the SSMTMP and CEQA process,” the report states, admitting its requirement to adhere to environmental laws. Yet instead of making sure that possibly significant harmful impacts of building trails up to SSFL have been “avoided, reduced or minimized” to below significance, the county plan downplays the issue without analyzing it. The report, which totals hundreds of pages, sloughs off the lab’s toxins in just two sentences. 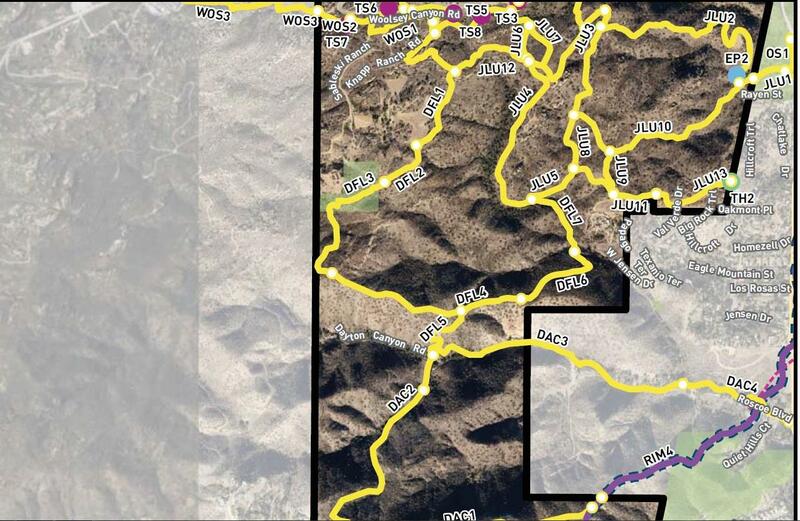 “Immediately to the west of Phase II.b, the newly announced conservation area on the Santa Susana Field Laboratory implies future opportunities to connect with that open space following a major cleanup,” the plan appendices say. “The Laboratory’s ongoing efforts to dedicate portions of their property to land conservation could present an opportunity for future trail easements.” The plan also presents an opportunity to rain down toxic dust on new trail users where the winds usually blow downhill from SSFL all over the Phase II.b area. 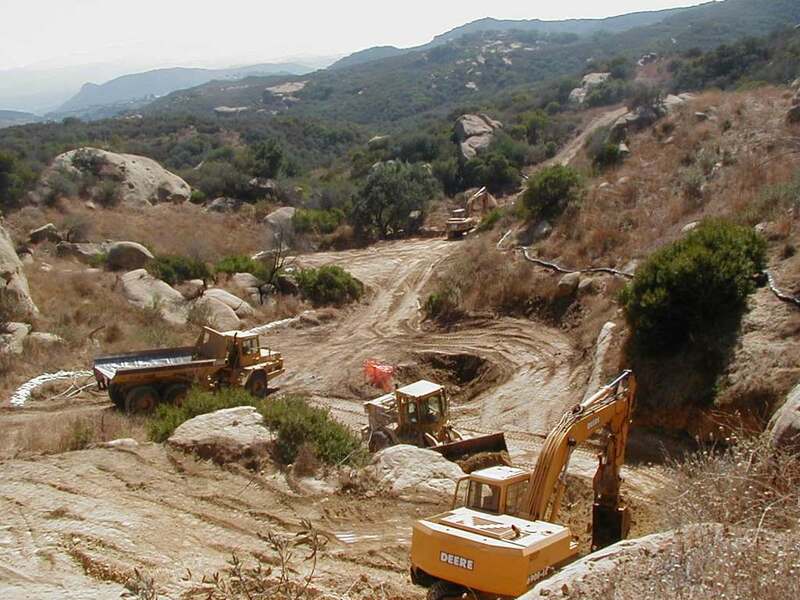 The Trails Master Plan’s reference to Boeing’s controversial easement is perplexing given that representatives of LA County, Ventura County, and the LA City Council immediately objected to Boeing’s August 2017 announcement that the easement relieved it of its previous cleanup commitments, stating in a September 2017 letter that “Boeing’s attempt to reduce the level of clean-up to a much weaker standard will leave some of these toxicants in place, risking people’s health long into the future.” LA County Supervisor and Board Chair Sheila Kuehl has been a longtime advocate for full cleanup, weighing in as recently as December 6, 2017 with a letter to the Department of Toxic Substances Control (DTSC) urging full cleanup. Community groups have decried Boeing’s easement as a thinly veiled attempt to get out of the cleanup, claiming that even if the site becomes open space, using recreational cleanup standards would leave most of the contamination on site where it will continue to migrate and threaten nearby communities. Comments from community members, elected officials, environmental and community organizations submitted on DTSC’s recent SSFL draft Environmental Impact Report (EIR) instead demand that the agency uphold its previous cleanup commitments to clean up all of the contamination at SSFL. An August 2017 DTSC monthly update released October 3, 2017 tacked on an additional 17 years to the cleanup which was supposed to be completed this year. “Project cleanup schedules will be further defined in the remediation planning documents and associated designs, however if soil cleanup begins in early 2019, remediation of all chemically and radiologically impacted soils is anticipated to be completed by the end 2034,” said DTSC in the notice. EnviroReporter.com wasn’t the only SSFL watcher astonished at the incomplete CEQA for Phase II.b. Concerned environmental and nuclear policy groups weighed in also with little more than three days to analyze the trails master plan and comment. 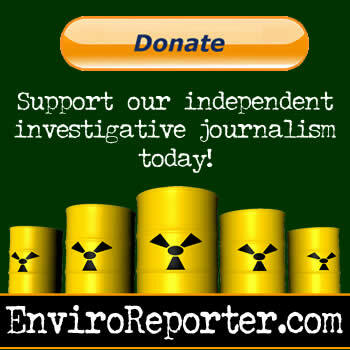 They included the Rocketdyne Cleanup Coalition, Committee to Bridge the Gap, Southern California Federation of Scientists and Physicians for Social Responsibility–Los Angeles, the latter of which is part of a coalition that won the Nobel Peace Prize this year for its nuclear policy work. 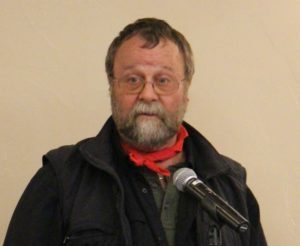 Further infuriating SSFL cleanup proponents are county plans to name much of this trail system after a vocal opponent of the remediation, John Luker. Luker was first exposed as an SSFL polluter tool in 2012’s Boeing’s Meltdown Makeover series in Operation Astroturf and has reappeared as recently as 2017’s Brandeis-Bardin’s Toxic Denial. A new comprehensive analysis by EnviroReporter.com has discovered that the Phase II.b plan reveals a comprehensive effort to mislead decision makers and the public about the proximity and potential hazards of SSFL to the bordering Phase II.b. Looking closer at the Phase II.b maps, the Santa Susana Field Laboratory seems strangely absent. Indeed, since the project lies on the border with Ventura County but is located fully in LA County, planners didn’t see fit to include anything from Ventura County. Lopping off the study area at the county line, especially when the project borders SSFL, appears an especially abnormal decision and seems to defeat the very purpose of a CEQA, protecting people and the environment. 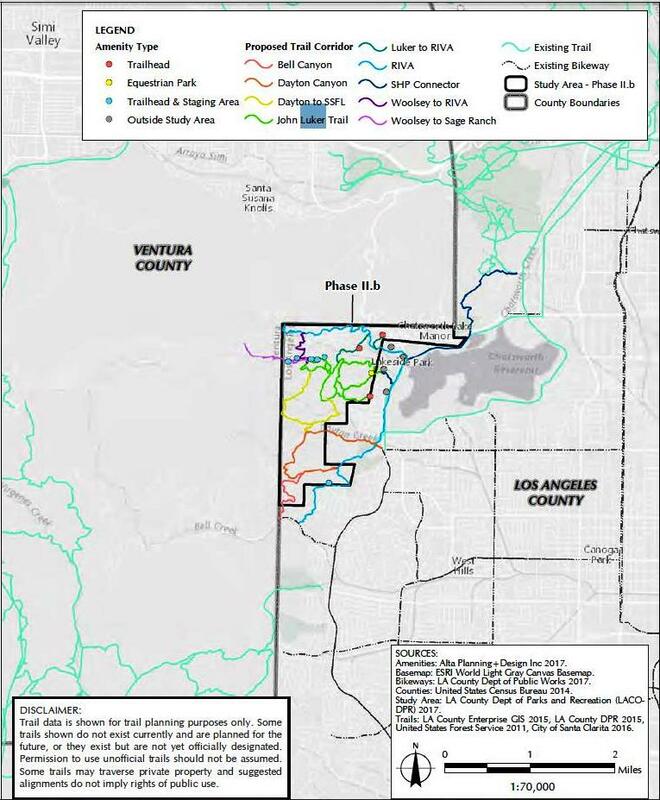 The planning team, headed by project manager Zachary Likins who began his new job as “park planner” for LA County in July 2017 according to Linked in, seemed to go even further than merely leaving information off of the Phase II.b maps. A figure on page 97 of Phase II.b’s mitigated negative declaration is called “Hazardous Sites within One-Eighth Mile of SSMTMP-PII Area” (see inset). The map figure shows a light blue line surrounding Phase II.b’s perimeter delineating what the legend says is the “Study Area 1/8-Mile Buffer.” The so-called “buffer” extends 1/8 mile into SSFL, a hazardous site if there ever was one, yet still shows it to be A-okay according to the buffer. 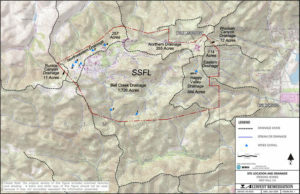 The map is false and helps erase SSFL from Phase II.b’s environmental report. It is hard to fathom how Los Angeles County planners could make such a mistake, if it was, indeed, a mistake. The very next page of the report does list SSFL twice in a hazardous sites table and called “Rockwell” as well as “Rockwell/Santa Susana Field Lb” [sic]. Both entries list the facilities’ “status” as “Open – inactive.” While the table’s designations are out of date (Rockwell sold SSFL to Boeing in 1996) and the status mystifying and false, it is clear the planners were aware of the place but chose to not include it in maps or any environmental assessment. Yet the contamination that has come down from SSFL through the Phase II.b area has been staggering. It also has been reported on extensively yet none of this information was included in the report. 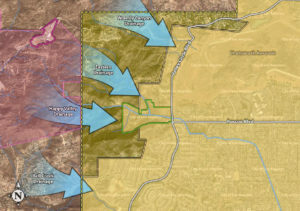 In 2003, Los Angeles CityBeat reported that “a reading of 17ppb [of perchlorate] draining from Rocketdyne into Happy Valley, a drainage outlet that leads down into the San Fernando Valley through Dayton Creek.” The center of Phase II.b is Dayton Canyon, which includes the creek. If there was one exposé that demonstrated the absolute necessity of a proper CEQA being done for the Phase II.b project, it would be 2012’s Dirty Deeds. That story featured video showing how huge clouds of possibly toxic dust were floating down towards the project area where the paths are proposed, paths that county planners say would be perfectly safe without actually knowing. Has the untested Phase II.b area been impacted by this dust? And what exactly is in that dust? The Los Angeles County Department of Parks and Recreation (DPR), which is responsible for Phase II.a and Phase II.b, held one meeting specific to each project area. 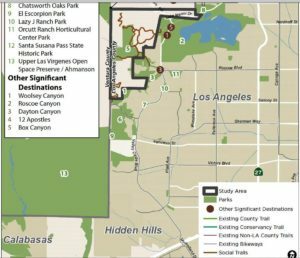 The one devoted to Phase II.b attracted “approximately 10 attendees” in Woodland Hills April 18, 2017 according to the DPR trails master plan. 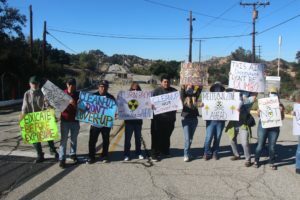 Not a single environmental group advocating for the cleanup of project-bordering Santa Susana Field Laboratory was contacted in any form that EnviroReporter.com could find. Most longtime neighborhood activists in both the San Fernando and Simi valleys were unaware of the project even though a few managed to comment on just three days’ notice. John Luker’s name on a proposed new trail for Phase II.b may be the key to why the county’s planning department conveniently forgot about the SSFL’s menacing manifestation on the area’s western border. 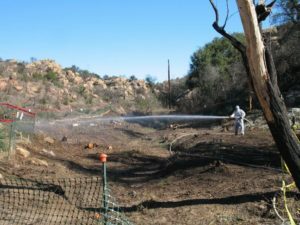 Luker is a director of the Santa Susana Mountain Park Association (SSMPA) and has spearheaded its anti-cleanup campaign of the lab. He has been part and parcel of Boeing’s greenwashing campaign, which absurdly claims that the cleanup will harm the environment when in fact the opposite is true – SSFL contaminants pose considerable risk to wildlife. 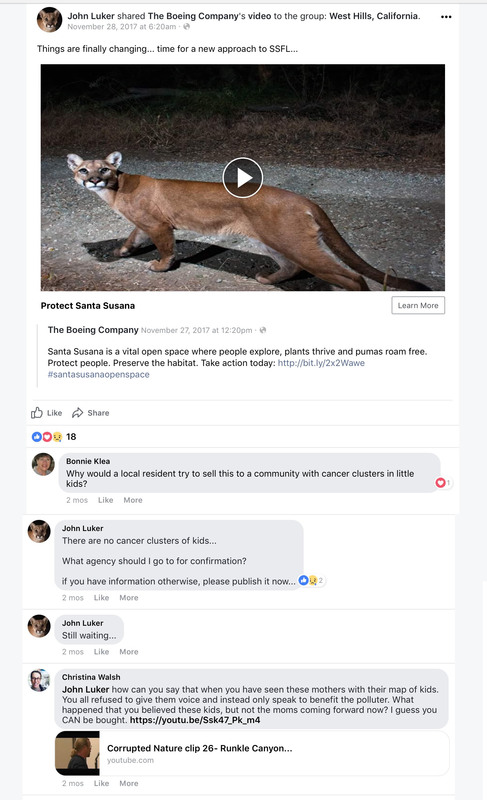 Luker’s background leading hikes through still-heavily polluted SSFL is well documented as was shown in the 2016 exposé Critics question safety of Boeing’s Santa Susana Field Lab hikes. 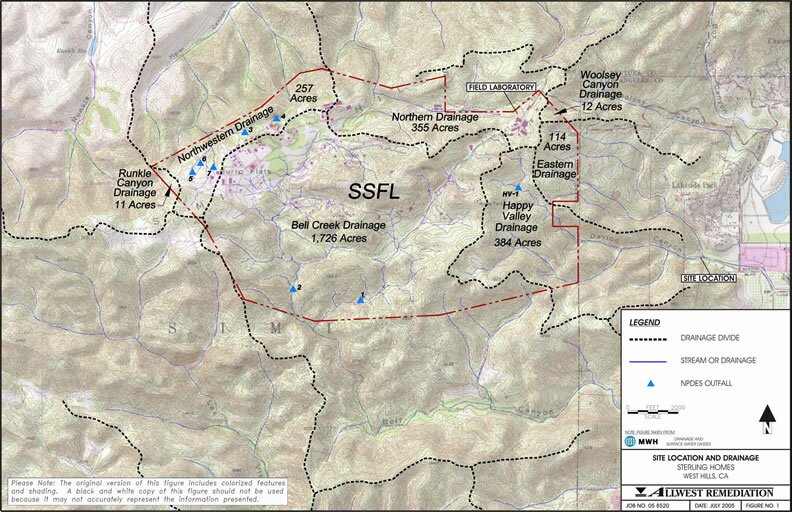 The ersatz Glow in the Dark Park ranger admitted proudly that he had taken over a thousand waiver-signing hikers, including kids, through the Southern Buffer Zone (SBZ) of SSFL that has tested positive for radium-226, plutonium-239/240, trichloroethylene (TCE), dioxins, PCBs, and perchlorate pollution. The SBZ border with the Phase II.b project area is little more than a barbed wire fence in the hills, hardly an anti-contamination barrier. “In any case, I talked to Kamara [Sams, Boeing representative] earlier yesterday and they’re going to publish a map that shows where contamination is in the Southern Buffer Zone and what levels so people can see what they’re walking through,” Luker said without a trace of irony. This clue as to Luker’s disregard for the toxins radiating from SSFL indicates haphazard county research and lack of sound science. Another master plan faux pas is a serious insult to Native Americans. It is unlikely that these Native Americans were aware or approved of the longest Phase II.b trail being named after John Luker. Indeed, there is no indication of any public input into the naming of the proposed “John Luker Trail,” because if there had been, Likins and crew may have thought the better of it. Luker’s unhinged attacks include harassing cancer victims, such as former SSFL worker Bonnie Klea, profiled in Atomic Avenger. Luker also chided parents of children with cancer who live near SSFL, telling distraught families at a February 21, 2017 Dept. of Energy hearing that their children’s cancer didn’t come from SSFL and to look into their back yards instead. (Nearly 50 cases of pediatric cancer have been identified near SSFL by West Hills resident Melissa Bumstead, whose daughter Grace has twice been diagnosed with a rare leukemia. Melissa and other parents believe their findings are consistent with federally funded studies that indicate increased cancers near the site.) Luker nevertheless regularly denies health impacts from SSFL while cheerleading for Boeing’s greenwashing plan on Facebook. The County of Los Angeles’ trail planners know all of this information now formally. Much of this material was submitted in this reporter’s comments. When Likins and fellow planners release their adjusted Trails Master Plan, it will hopefully shelve the entire Phase II.b part of the proposal until SSFL is remediated to background. 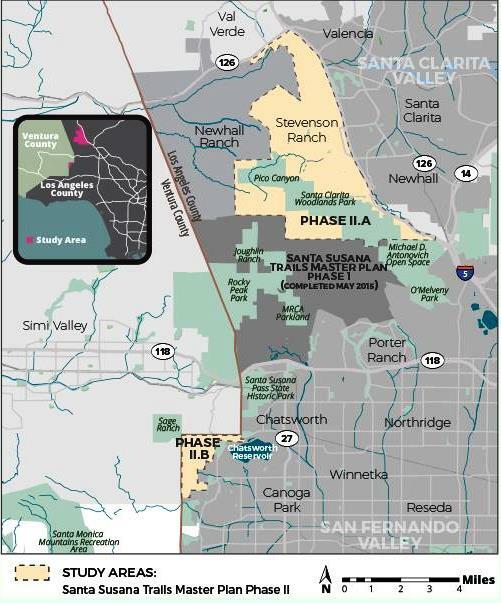 The larger Phase II.a part of the master plan near Santa Clarita doesn’t face these kinds of environmental threats and should be implemented. The Trails Master Plan says it will mail out a notice to property owners within a half mile of the project areas, a fraction of the folks that would be affected should Phase II.b come to pass. Countless hikers, mountain bikers and equestrians could be exposed to some of the planet’s most virulent poisons should the scheme succeed. 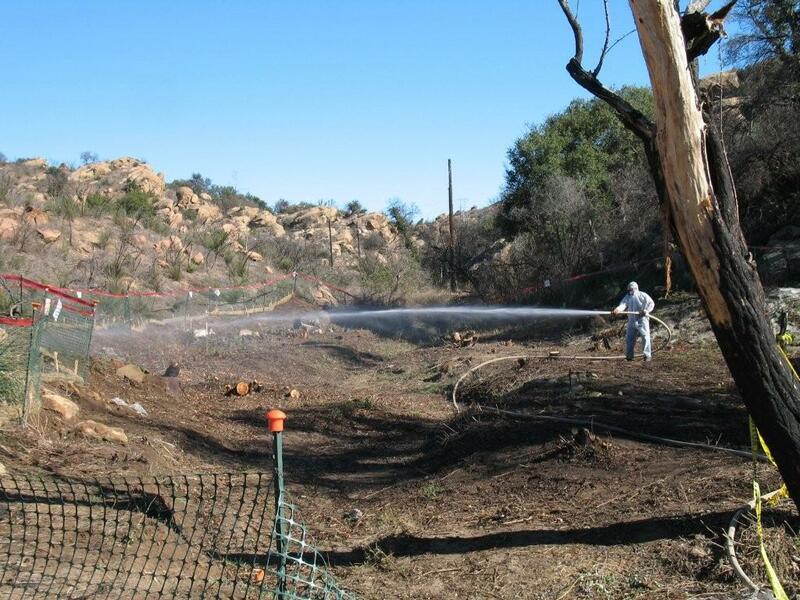 The plot to trail blaze a costly new path up to an unremediated SSFL is on track to become a permanent and potentially dangerous stain on the Los Angeles County Department of Parks and Recreation. In the process, trail planners would have sabotaged county efforts to make the polluters of SSFL clean up their goo to background and restore the place to its original splendor before becoming a sprawling Nazi-origin rocket testing compound. LA can do better to protect its citizens and honor its past. In this case, it can save its money and save face by simply stopping this bold attempt to build trails in toxic terrain with no environmental studies. That would be a prudent decision for the people in both Los Angeles and Ventura counties. As a cancer survivor with multiple tumors removed and having a daughter with thyroid issues I cannot stress enough how many other people in West Hills and Simi Valley have died of cancer caused by the radiation they were exposed to from SSFL. Building trails there is a death sentence! Why would LA or Ventura intentionally kill it’s own people when California just passed a law banning smoking in the car with your own kids?!? This is all about making money. Developing up there without ANY clean-up!! Krizan is right to laud oak tree acorn planting. He is wrong to ignore critical facts easily obtainable by a simple Google search for, say, ‘john luker ssfl’. Sierra Star readers deserve more. I was diagnosed with a “golf ball sized”..meninginoma..It has as a main “explanation”exposure to radiation…I lived in Canoga Park 1959….I JUST found out about Rocketdyne..I used to watch Rocketdyne as a child…with its plumes from Calvert street…Are there any other kids from Enadia way Elementary School in 1959/…that have “brain tumors that want a class action lawsuit…People in Utah and Nevada have “ downwinder coverage…Why didn’t the San Fernando Valley get the same?…. In Simi Valley we knew a popular man who moved to the community in 1970. At least twice a week he rode his horse up in the hills south of Fitzgerald Road and Royal Avenue. One of the places where he rode his horse was due south of Rocketdyne’s Area IV. During dry weather, if he rode fast, he would kick up the dust in those hills, covering him from head to toe. When he got home the dust would get all over the carpet, much to the consternation of his spouse who would be stuck with the vacuuming job. Little did he know that he might have been stirring up radioactive particles in addition to the dust. He died of cancer in 2006 from a type cancer which his physicians said was related to significant exposure to radioactivity. 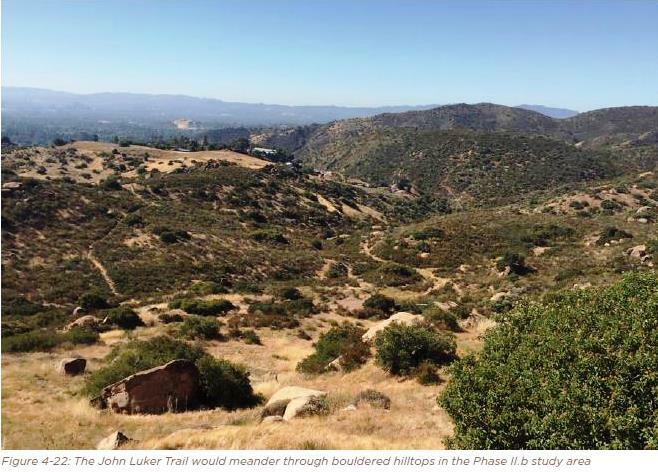 As described by Enviroreporter in this article, Los Angeles County wants to build trails in the hills due east of Rocketdyne. Presumably those hills are “sprinkled with badness” from business operations which took place in the hills of nearby Ventura County between the 1950’s and the present. 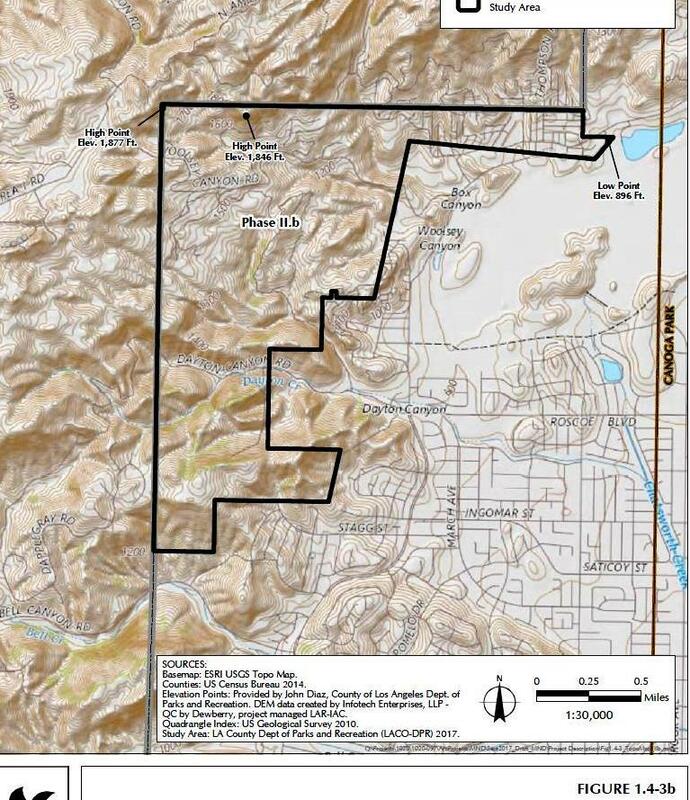 Boy Scouts, Girl Scouts, adventurous teenagers and TAXPAYERS will be walking those trails in perpetuity, as long as people reside in the San Fernando Valley. Los Angeles County will promote those trails to “outsiders” by advertising the County’s crown jewel, its network of trails running from Malibu to Santa Clarita and beyond. 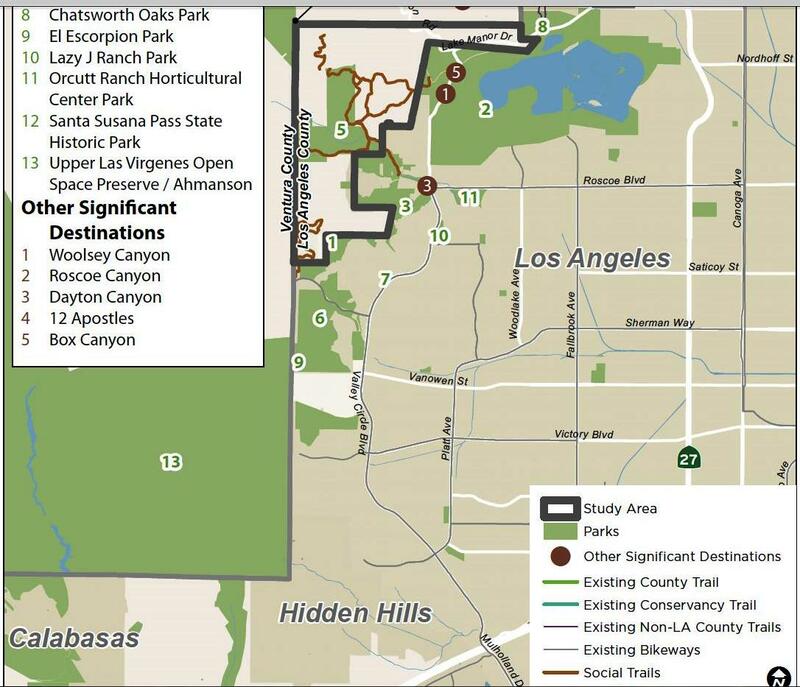 Some of those people will walk those trails, kicking up dust, once or twice a month because the trails will be accessed from residential neighborhoods in L.A. County and City. 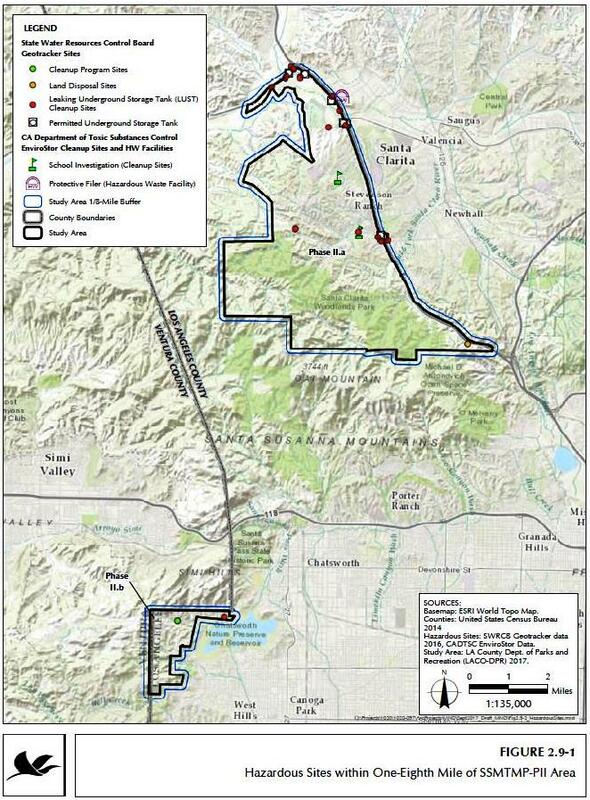 Possibly some of those trail walkers will get sick and die like our Simi Valley horse-riding friend did. Some of their doctors might even suspect that exposure to radiation was the cause of their illness. The Sovereign Immunity doctrine explains why L.A. County’s in-house lawyers have likely said to the Parks Department decision makers and the Board of Supervisors members “Don’t worry about health risks to the public from hiking trails we build.” Under the California Tort Claims Act, there is no personal injury liability for local government agencies or their elected decision makers and employees in the absence of specific language in a statute or constitutional provision expressly creating and assuming liability for the local government agency. Under the California Government Code a county or city is not liable for personal injuries arising out of the discretionary choices made by a Board of Supervisors, a City Council or a public employee making management level project design decisions. The public employees and elected officials who made the discretionary decision are not personally liable for other people’s personal injuries when the public employees and elected officials have made discretionary decisions which have untoward consequences. For example, in the San Fernando Valley there have been deadly Metrolink crashes over the years, some of them at street/track crossings that the National Transportation Safety Board has said were incorrectly designed under the NTSB’s at-grade crossing design safety standards. The cities responsible for the Valley’s unsafe at-grade street/track crossings have prevailed in California courts and walked away without spending a dime to reimburse injured commuter train passengers for medical treatment of their injuries after a crash at an intersection which is not up to NTSB safety standards. Yes personal injury plaintiffs lawyers can split hairs and if they are lucky get an elected trial judge to rule that the County’s decision to build a hiking trail near a radioactively contaminated site, or the County decision to fail to put up hazard warning signs at the beginning of the trail or along a creek is NOT discretionary. However history shows that when this sort of trial court decision goes up on appeal, the California Courts of Appeal and Supreme Court are likely to reverse it. By and large if there is something “stinky” about management decision making by public employees in an L.A. County department like Parks or Regional Planning it is because some business interest has “gotten to” the senior public employees in that department. You can talk to lawyers and environmental activists who regularly litigate against Regional Planning. They will quote you chapter and verse about how the County departments’ decisions are affected by pressure from big businesses located in L.A. County. Each member of the Los Angeles County Board of Supervisors is a king or queen in his or her District. Generally speaking, what a Supervisor wants they get, in terms of discretionary decision making by the Board and county employees about what is built or not built by the County in the Supervisor’s District. 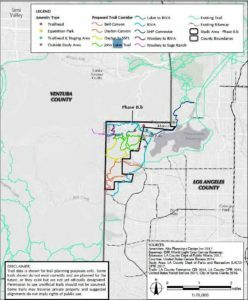 At this juncture activists who do not want the public put at risk of illness by the building of the trails discussed in this article have one person they have to persuade to reject these trail locations: The L.A. County Board of Supervisors member in whose District these trails will be located. But beware because discretionary decisions by individual Supervisors are often shaped by persuasion and threats from big businesses operating in the County. You’ll never hear or see that persuasion but you will hear and see evidence of it each time a controversial discretionary decision is made. Fantastic article Michael! Well done! It makes my blood boil to hear what they are planning. It’s obvious they don’t care about the people this affects! Please keep us all informed as you always do. Without you the public would not know what these companies are trying to get away with! Thanks again Michael! 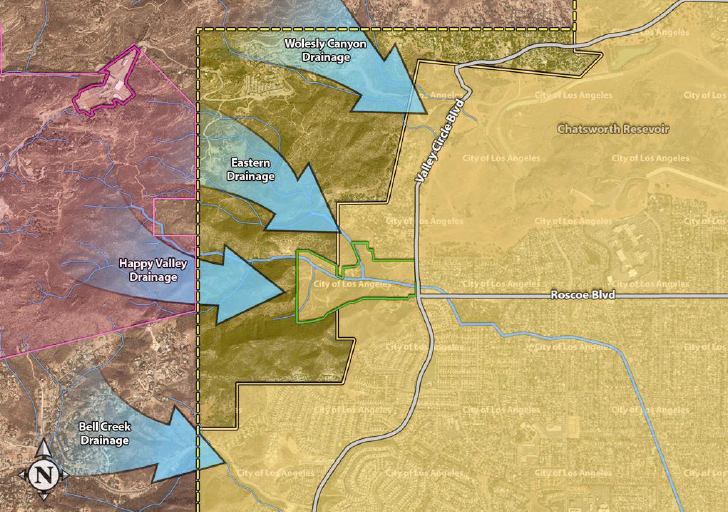 It would seem the public interest would be better served by clearly marking contaminated areas such as Dayton Canyon Creek instead of building access into them with new trails. Isn’t there potential future harm or liability by allowing and encouraging access to these areas without first cleaning them up and the SSFL sites that drain into them? A little common sense would seem the best course of action when it comes to public health and wildlife welfare. What is taking so long for decisive action to be taken. At least warning signs should be put in place, not a welcome mat complete with trail guides. Thank you Michael for your excellent reporting. This is very upsetting to once again Boeing and its astrotrurfers are lying about safety and not planning to clean up this contaminated site, letting the public think that it is safe. The fact that not too many people know when the meetings are held.